Samsung launched its new Galaxy S5 smartphone amid much razmatazz at MWC Barcelona, and we’ve had some time with the hotly-anticipated new handset. For convenience, we’ve also included all of the official specifications on page two of this article. There are a couple of headline new features. The S5 now has a fingerprint reader, which you can use to unlock the phone or to make payments; currently only PayPal is supported. The fingerprint reader can also be used to secure and unlock private storage on the phone, so you can lock down images you wish to keep especially private, for example. There’s also a heart rate monitor, which you activate by pressing your thumb to the sensor below the camera and pressing the corresponding button within the S Health app. We’re not convinced of its accuracy, though; the measurement oscillated between 50bpm and 103bpm, while the Gear 2 Neo smartwatch measured around 80bpm consistently. The phone looks similar to the S4, but has a couple of differences. It’s slightly larger, due to the bigger 5.25in compared to 4.99in screen, and the back is now soft-touch textured rather than smooth as on the S4. We were fans of the soft back, which is pleasing in the hand, but wish Samsung would improve the hard ridged plastic around the edge of the phone. Once we started to use the S5, though, we started to be seriously impressed. The first thing that strikes you is the sheer quality of the screen. It has the same 1,920×1,080 resolution as the Galaxy S4’s display, but gives a significantly better picture. The screen is brighter than the S4’s, and has significantly less grain. It also has much purer whites, without the S4’s slight yellow tinge. Text is astonishingly sharp, too. It’s one of the best screens we’ve ever seen – it’s amazing how much Samsung has managed to improve on the S4’s display in a year. As you’d expect with a score like this, the S5 has absolutely no problem with complicated web pages, which render quickly and scroll around with not a trace of hesitation. We also ran the 3DMark benchmark on the handset in Unlimited Mode, as the normal and Extreme modes were too light for the device. Unlimited returned a score of 18,438, which is far quicker than the iPhone 5S’s 14,506, which was our previous high score. This is an astoundingly fast phone, whichever way you look at it. Be aware that out of the phone’s 16GB capacity, around 6GB is already taken up by system files and various apps, so only around 10GB is available to the user. You’ll most likely need to take advantage of the microSD card slot. The Galaxy S5 has an innovative mode to help prolong your phone’s battery life, called Ultra Power Saving. This goes further than any power saving mode we’ve seen. When you switch the mode on, which seems to take around 10 seconds, it turns the display to monochrome and restricts you to a single screen with a few vital apps. You can select which apps you want when the phone is in the mode, to make sure you still have the functions you absolutely need until you can find a power socket. Samsung claims the phone will give you around 24 hours of battery life from just 10% charge in when in Ultra Power Saving mode, hopefully giving you enough juice for a vital call or text. New to the Galaxy S5 is My Magazine, as seen previously on the Note 3 and Note Pro. This is a news and social feed aggregation app, in the style of HTC’s BlinkFeed, which we first saw on the HTC One. Swipe left from the homescreen and you’re presented with a picture-rich feed of things that interest you. The service is apparently based on Flipboard, and lets you choose to receive updates from social networks such as Flickr, Twitter and Google+, and information categories such as News, Style and Technology. Unfortunately, we couldn’t see any way to customise the news sources within each category. The S5 may not look much different from the S4, but we were surprised by how much Samsung has managed to improve in a year. The fingerprint reader is useful, we’re not sure about the heart rate monitor, but the phone is incredibly fast and the screen blew us away. The S5 will be a premium-priced smartphone, and we can’t see it being anywhere else but at the front of this year’s Android pack. We’re expecting the phone to hit the shelves in early April, but at the moment there’s no firm release date. Nor is there final pricing available for the handset, either. We’ll be updating this page with the latest prices and deals as they come in. Until then, it’s safe to assume that the Samsung Galaxy S5 isn’t going to be priced radically differently to the existing Samsung Galaxy S4. When we reviewed that handset it was £600 SIM-free, although the networks were doing various deals if you signed up for a contract at the same time. One of the biggest rumours going around was that the S5 was going to up screen size to 5.25in and have a massive QHD (2,560×1,440) resolution. However, this has proved to false, and the true specs are a 5.1in screen with a Full HD (1,920×1,080) resolution. While the screen is a little larger than on the Galaxy S4, which had a 4.99in display, the resolution hasn’t changed. While that may be disappointing at a first glance, we think it’s a sensible move. On a screen this size more pixels isn’t particularly going to radically improve image quality or make things look sharper. Instead, it’s just going to give the phone more pixels to deal with, which could have had a negative impact on performance, particularly in games. Despite the slightly larger screen, Samsung has only had to increase the size of the Galaxy S5 slightly and it measures 142×72.5×8.1mm and weighs 145g; this compares well to the Galaxy S4, which measures 136.6×69.8×7.9mm and weighs 130g. Design wise, the Galaxy S5 doesn’t look a massive amount different to the S4. It’s still made of plastic, with a ridged metal-effect band running round the side. The rear has a dimpled back. It looks great in pictures, although we’re saving final judgement for when we get our hands on the product. More interesting is the IP67 rating, which means that the phone is both dust and water-resistant. That doesn’t mean that you can go swimming in safety, but the S5 should be safe from day-to-day spillages. Again, as widely predicted the S5 has a fingerprint sensor, built into the Home Button, catching up with the TouchID scanner in the iPhone 5S. As you’d expect, Samsung’s scanner can be used to unlock the phone with a finger swipe. However, it can also be used for safe mobile payments. Currently, PayPal payments can be authenticated in this manner, although there’s no reason why other forms of payment or contactless can’t be authenticated via a fingerprint in the future. At the moment all we know is that there’s a 2.5GHz quad-core processor inside the phone. At the time of writing we didn’t have final specs or any information on the GPU. We’ll bring you the latest information as we have it. As predicted, Samsung has upped the sensor from the 13-megapixel version in the S4 to a 16-megapixel version for the Galaxy S5. Specs alone don’t tell the story, as a larger sensor doesn’t necessarily equal better image quality. However, it looks as though Samsung has worked on improving the experience. For starters, Samsung is claiming that the Galaxy S5’s camera has the world’s fastest autofocus speed of up to 0.3 seconds. For anyone that’s tried to take a quick photo from a smartphone only to have the focus hunt for a lock, this could be a real boon. Next, is a Selective Focus mode, which lets you focus on a specific area of the frame, blurring everything else out. It should allow for some neat depth-of-field effects. In video mode the camera can also shoot Ultra HD 4K (3,840×2,160) video at 30fps. That’s pretty impressive for a camera, although you’re going to need a large memory card to shoot a lot of video. Fortunately, there’s a microSD card slot, which can take cards up to 128GB in size. Samsung has upped the battery in the Galaxy S5 from the 2,600mAh model in the S4 to a 2,800mAh. Given the slightly larger screen, we’d say that the new battery (which has almost an eight per cent capacity improvement) will likely even things out and we’ll see around the same battery life; we’ll have to wait until we put the smartphone through our regular tests before we know for sure, though. If you’re worried about running out of juice, Samsung has a new power-saving mode. This switches the phone’s screen to black and white mode, shutting down all unnecessary features to minimise battery consumption. No further details were available on this at the time of writing. Samsung has upgraded the wireless connectivity inside the smartphone. First, the category 4 LTE, which means that phone will be compatible with more networks. When 4G roaming starts to become more common, this could be very useful. Wi-Fi has been upgraded to 80.11ac with 2×2 MIMO. Impressively, both wireless devices can be used together using Download Booster. This wireless bonding technology should allow for some impressive download speeds, although it’s a matter of finding services that require and support this kind of speed. From the teaser information that Samsung sent it, it was clear that fitness was going to be a big part of the phone. As well as a new version of Samsung’s fitness tracking app, S Health 3.0, the phone now has a built-in heart rate monitor. It still needs to be used with additional devices, such as a pedometer for other measurements, though. Samsung has said that the Galaxy S5 will go on sale in April. Pricing hasn’t been announced, although we expect to get that later on in the evening or tomorrow, as the networks announce their plans. In the meantime, anyone interested can pre-register online at www.samsung.com/uk/galaxys5. Just six months after Samsung Electronics released its first smartwatch, the company will start selling three more. Following up on the Android-based Galaxy Gear that came out in September, Samsung unveiled a trio of new watches this week at Mobile World Congress in Barcelona. The South Korean electronics giant seems to be flooding the zone in the hopes of running out the clock on Apple before it can release the much-anticipatediWatch. Samsung’s Gear 2, which has a built-in camera, and Gear 2 Neo, which doesn’t, can wirelessly connect with smartphones and run apps designed for a relatively new operating system championed by Samsung called Tizen A third watch, the Gear Fit, has a curved screen, runs basic software and is positioned more as a health device to rival the Fitbit — though it does tell the time. The smartwatch wave isn’t isolated to Samsung. Motorola Mobility, which Google is selling to China’s Lenovo Group, said in Barcelona that it plans to release a smartwatch this year, and CNETreports that LG Electronics is working on one, too. Seriously, they might as well call it Mobile Watch Congress. HTC, the Taiwanese smartphone company that’s currently in the red, is expected to be demonstrating the first of three wearable devices behind closed doors in Barcelona, my colleague Tim Culpan reported. On the show floor, Sony is showing the SmartBand, and Huawei Technologies has the TalkBand. “We think that wearables in the future can be a large market,” Colin Giles, an executive vice president at Shenzhen, China-based Huawei, told Bloomberg News in an interview this week at Mobile World Congress. Not everyone is convinced. Despite a marketing blitz, Samsung’s original Galaxy Gear was met with a lukewarm reception. Research firm IHS estimates the market for wearable devices, which includes smartwatches, to be worth less than $20 billion a year until at least 2015. Apple alone sold more than that in iPhones last quarter. Barclays analyst Ben Reitzes wrote in a note last week that a smartwatch isn’t going to move the needle for Apple’s business. A spokeswoman for Apple declined to comment. Timing is everything. Apple isn’t always the first, but it’s shown a knack for putting together the right list of features in a well-designed package along with marketing that shows people why they need to have one. There were plenty of music players on the market before the iPod. Morgan Stanley analyst Katy Huberty estimates that an Apple watch could generate as much as $17.5 billion in its first year on the market. That would be just under what the iPad did in its first full year available. Of course, the tech industry is very different from the days of the iPod. For one, Samsung is relentless. First impressions of the Gear Fit coming from Barcelona have been glowing. If Samsung keeps releasing a handful of new watches every six months, it might just find a winner. of mobile phones and TVs, has reported a drop in quarterly profit for the first time in two years. Net profit was 7.3tn won ($6.8bn; £4bn) in the October-to-December period, down 11% from the previous three months. Samsung’s earnings were hurt by a drop in margins in its mobile phone division, which saw operating income fall 18% quarter-on-quarter. A special bonus payment and currency fluctuations also hurt its earnings. The company paid a special bonus totalling 800bn won to employees during the quarter to celebrate the 20th anniversary of Chairman Lee Kun Hee’s management strategy, which is widely credited to have spurred its growth. Meanwhile, it said that fluctuation in the South Korean currency dented its earnings by 700bn won. The firm warned that it would be “challenging” for it to improve its earnings in the current quarter as weak seasonal demand “will put pressure on demand for components and TV products”. The success of its smartphone division has been one of the biggest drivers of Samsung’s growth in recent years. It helped the company displace Nokia as the world’s biggest phone maker in 2012. However, the South Korean firm is facing increased competition in the sector as other manufacturers have launched new models. One of Samsung’s biggest rivals, Apple, launched two new models of its iPhone – the top-end 5S and a cheaper 5C – in September last year. Nokia – whose phone division has been bought by Microsoft – also unveiled two new phone models in September, while Taiwanese firm HTC launched its latest handset, the Android-powered One Max, in October. 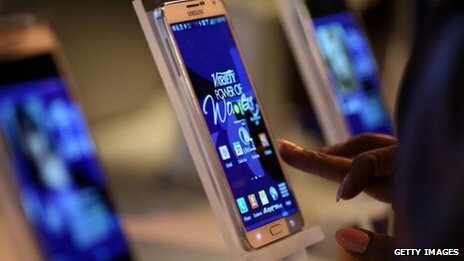 Analysts said the launch of the models had affected Samsung’s performance during the October-to-December quarter. In its earnings release, Samsung warned that it expected competition in the sector to “intensify” this year. It added that as firms looked to grab a bigger share of the market, they could cut prices of their products. Any such move would likely impact profitability in the sector. Despite a decline in profits in the last quarter – Samsung posted record annual earnings. The firm made a net profit of 30.5 trillion won ($28bn; £17bn) in 2013 – a 28% jump from a year ago. It said its performance during the year was boosted by the success of its smartphones and tablets, as well as robust demand for TVs. The firm said it maintained its market leadership in mobile devices, with a 30% share of the smartphone market in both developed and emerging markets. The firm said that it would offer new products in the smartphone and tablets sectors, as well as expand into areas such as wearable technology which would help it sustain its profit growth in the coming quarters. “Looking at the quarterly earnings trend, we expect 2014 to follow last year’s pattern of a weak first half and a strong second half as usual,” Robert Yi, the firm’s head of investor relations, said in a statement.